Celebrating two decades of successful performance, growth and risk control for clients. 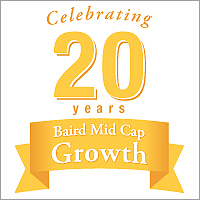 Baird’s Mid Cap strategy invests in high-quality common stocks, selected from among mid-sized companies that are expected to increase in strength and value. Baird makes a market in the securities of Dollar General Corporation, O'Reilly Automotive Inc., PVH Corp. and Under Armour, Inc.
Whitepaper - Why Mid Cap?